If you care about animals and want to see them protected from cruelty, then please join us this Saturday as we rally side-by-side, right across the country, for an end to live export. As you read this, more than 10,000 Australian sheep await an uncertain fate in Pakistan. They have witnessed half their companions slaughtered in the most brutal ways — clubbed, stabbed and buried alive. Every day that passes, more and more animals are put at risk of extreme cruelty and abuse. Despite assurances from the Australian Government that cruelty in the live export trade would be addressed, animals continue to be neglected,brutalised, and have their throats cut while fully conscious. 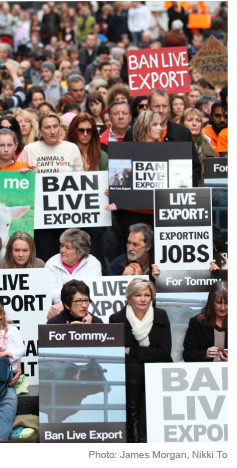 Tragedy after tragedy reveals that animals exported live will always be at risk. And yet, they continue to be sent. This sends the appalling message to the rest of the world that Australia accepts animal cruelty. The animals are depending on us — we must urgently let politicians know that caring Australians will not vote for political parties that support live export. This is your chance to join with others at a family-friendly event to rally for a kinder future for animals. P.S. I realise that Saturday 6th October is short notice for a national rally. But I'm sure you'll agree that the latest shocking abuse of animals in the live export trade warrants a rapid response on a national scale. The Animals Australia team is pulling out all stops to create an event that our politicians won't be able to ignore. Unavoidably, this has meant that the launch of Make it Possible has been delayed one week. I'll keep you updated as our campaigns progress. All welcome! Hear from Animals Australia Investigator Lyn White, leading politicians; mass petition signing; campaign activities; family-friendly.